You may think writing a list of all your goals will take forever, but write them down anyway. The list will be much shorter than you think. Consider everything you would accomplish if you had no limitations. Write each thing down. 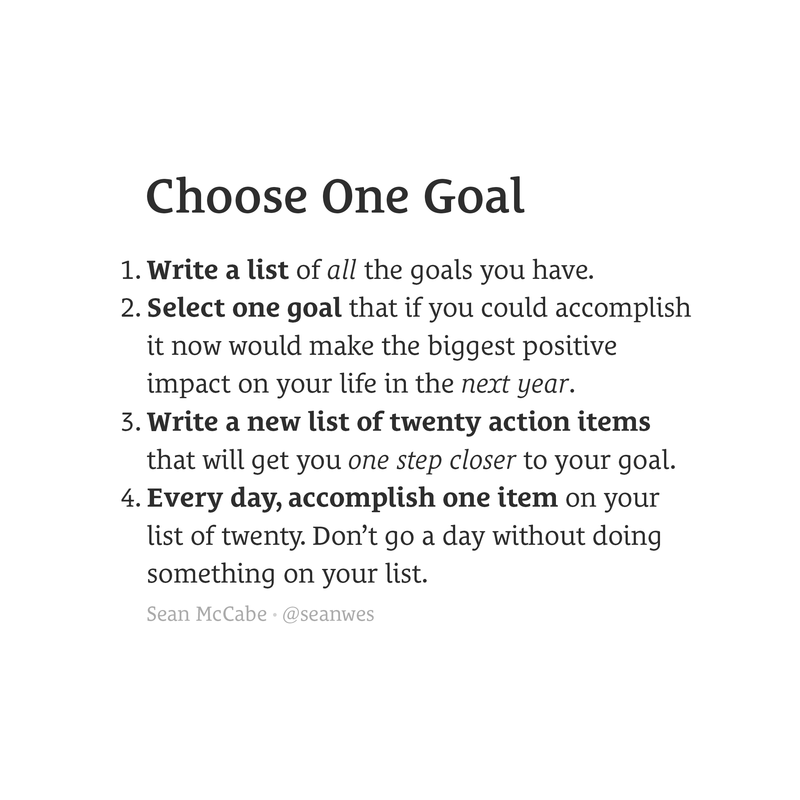 Select a single goal from your list that would make the biggest positive impact on your life in the next year. Focus on this one and set the rest aside. Successful people know what they want, and they invest every ounce of their energy in going after that one thing. You can achieve many great things in life, but you can achieve only one truly great thing at a time. If you try to pursue many goals at once, you will not succeed at any of them. You need clarity. Set a single goal for yourself in this season—not multiple goals, a single goal. You have to know what you want in order to get what you want. Write twenty action items that will get you a step closer to your goal. Coming up with the first five will be easy. Ten is going to be hard, but I want you to press through. Do not stop until you get to twenty. The twentieth thing might be the one that works, so don’t stop short. Every single day, you need do one of the things on your list. Don’t go a day without doing something on your list. If you haven’t done one of the things on your list, don’t watch TV, play games, check social media, or go out with friends. You must sacrifice.